Buccaneers serving with Nos 15 and 16 Squadrons in Germany have been adapted to carry Paveway laser-guided bombs, as seen here. The example seen here is from the No 208 Squadron, RAF, one of two now operating the Buccaneer in the UK. 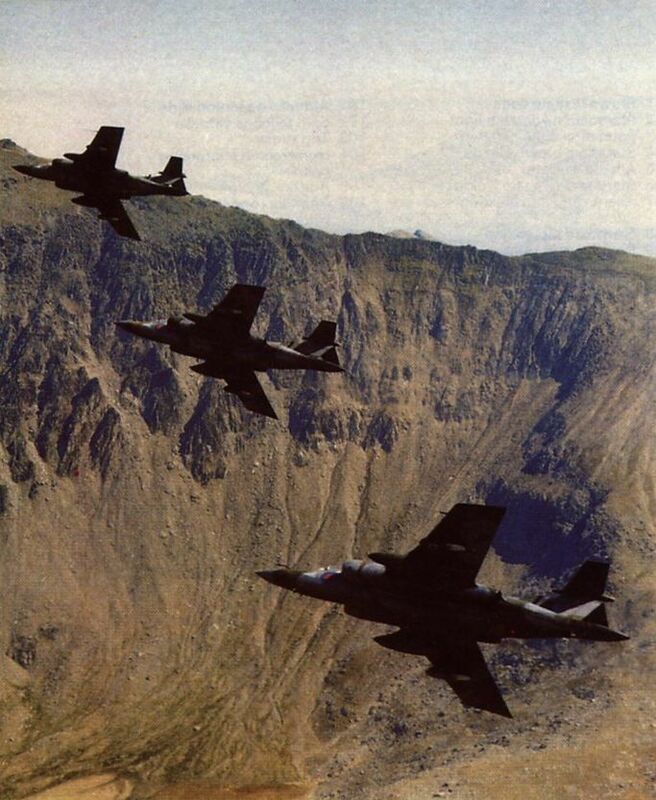 In desert camouflage for their participation in "Red Flag 77-9' these Buccaneers of No 208 Squadron are about to descend into the weapon ranges near Salt Lake City in Utah after a high-level transit from Nellis AFB. Several Buccaneers have been used for research and other special duties, including weapon research and development at the RAE. 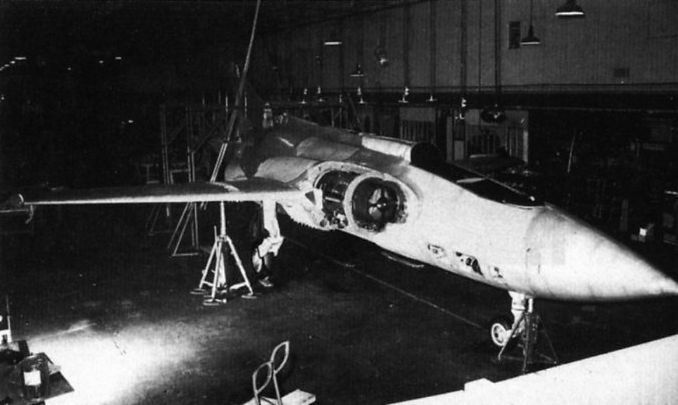 The prototype Buccaneer in the Experimental Department at Brough "looking like an aircraft but full of holes that wanted filling with vendor items ”. Six of the development batch aircraft at Holme-on-Spalding Moor. As seen here, the tailplane-to-fin fairing and the strokes on the fuselage-end airbrakes underwent considerable development. An early production Buccaneer S Mk 1, with definitive tailplane/fin acorn, in the early Naval all-white (anti-radiation) finish. 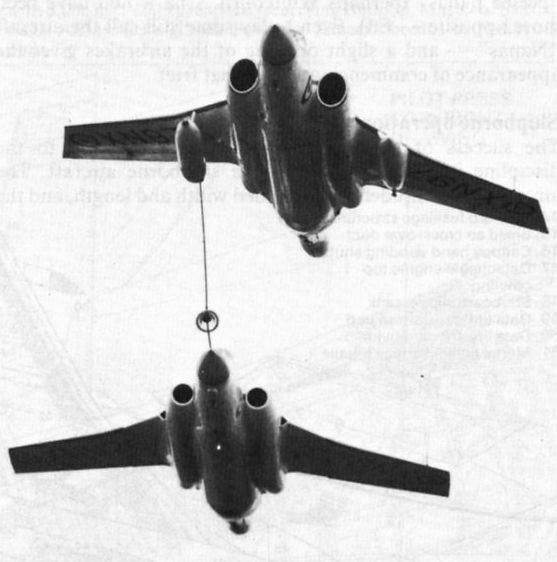 A Buccaneer S Mk 2, with buddy-buddy refuelling pod under the starboard wing, refuels an S Mk 1. Differences between the two marks are well shown, including the S Mk 2's larger engine intakes, lack of wing root intakes and revised wing tip shape. 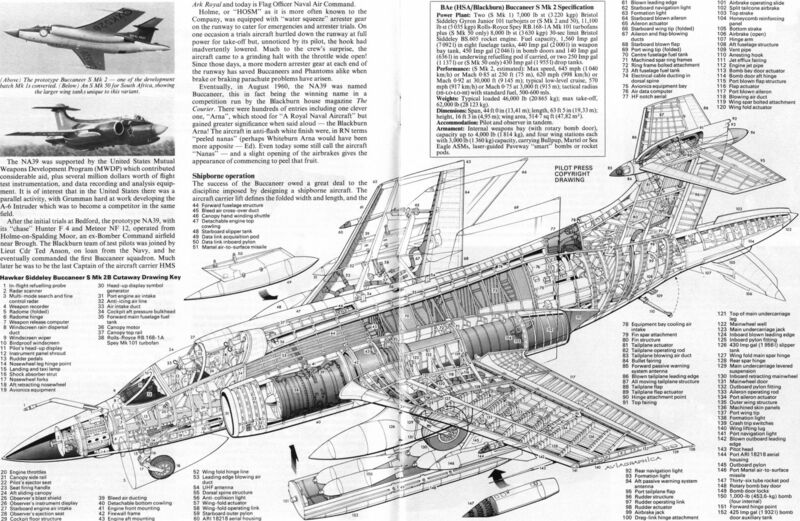 The prototype Buccaneer S Mk 2 - one of the development batch Mk Is converted. Buccaneers of No 208 Squadron, with Westinghouse ECM pods under the port wings. 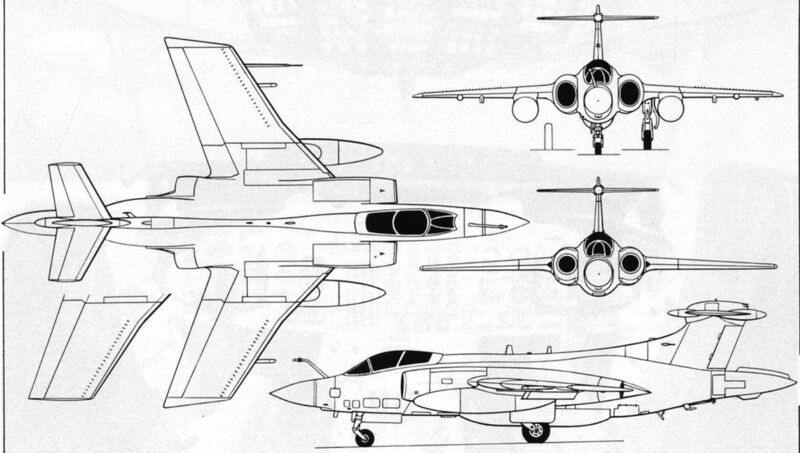 A 1965 illustration showing Buccaneer S Mk 2s of No 700B Squadron, RN, for Intensive Flying Trials in the later finish with grey upper surfaces and white undersides. 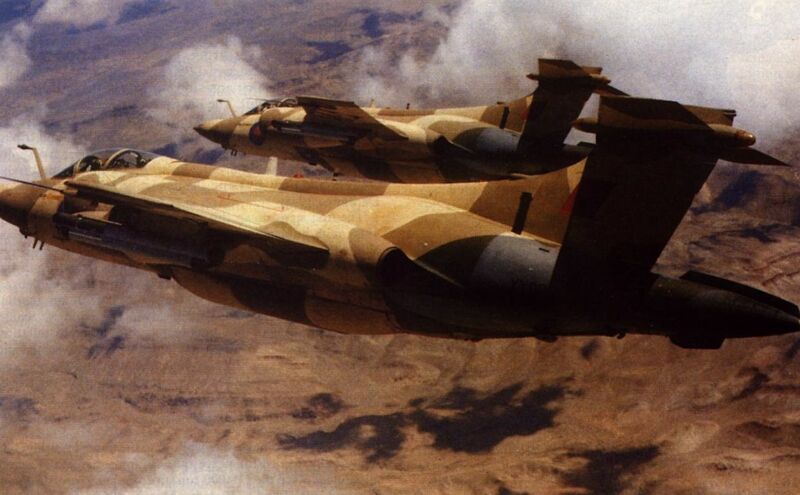 A pair of Buccaneer S Mk 2s from No 208 Squadron fly at low level through the Rocky Mountains of Western Canada, during the deployment in 1981 for participation in “Maple Flag" exercises. 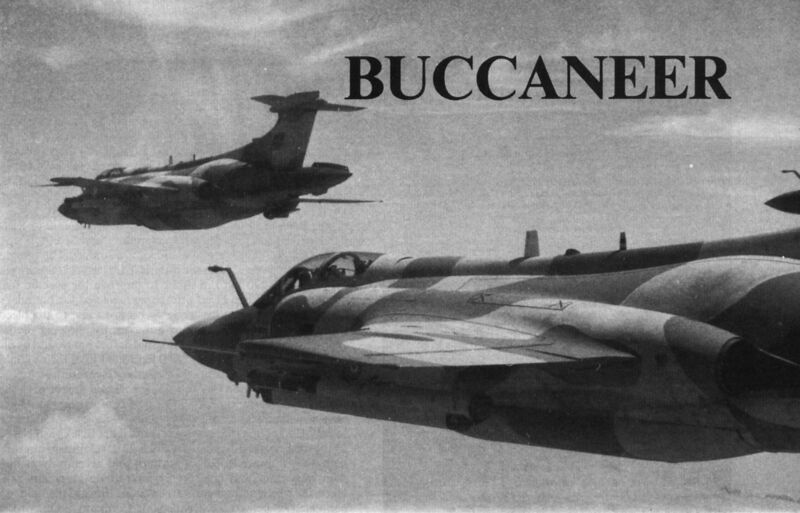 Buccaneers of No 16 Squadron participated in "Red Flag" exercises in Nevada in 1981, following No 208 s pioneering at this event in 1977 and 1978, when led by the author of this account. 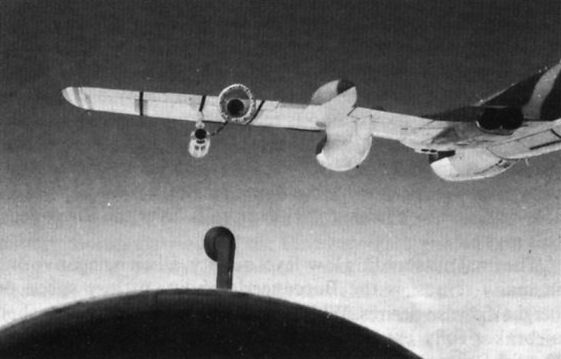 Note the Sidewinder visible under the wing of the nearest aircraft. An S Mk 50 for South Africa, showing the larger wing tanks unique to this variant. 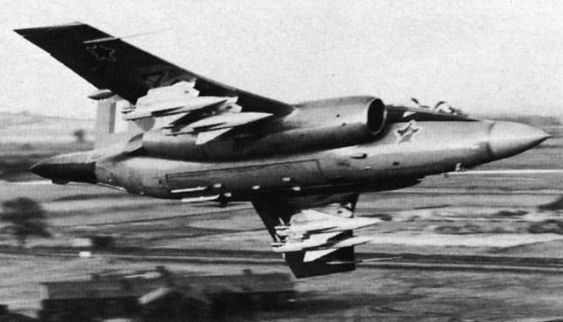 Weapon load possibilities for the Buccaneer include up to four Nord A S.30 air-to-ground missiles. Buccaneer production at Brough. Visible here is the No 6 aircraft for South Africa on the extreme left and the 14 th Mk 2 for the Royal Navy in the centre foreground.